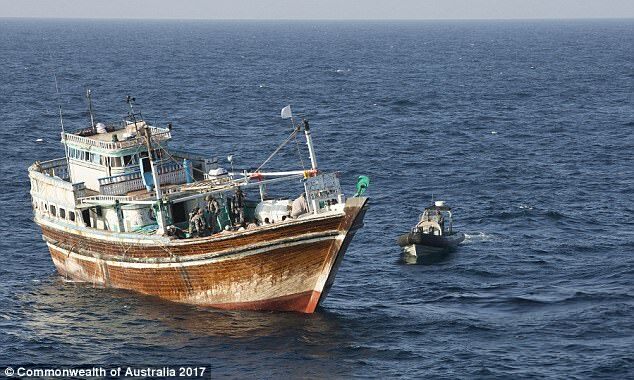 Heroin and hashish worth close to half a billion dollars has been seized by the Royal Australian Navy in three ships stationed in the Arabian Sea. 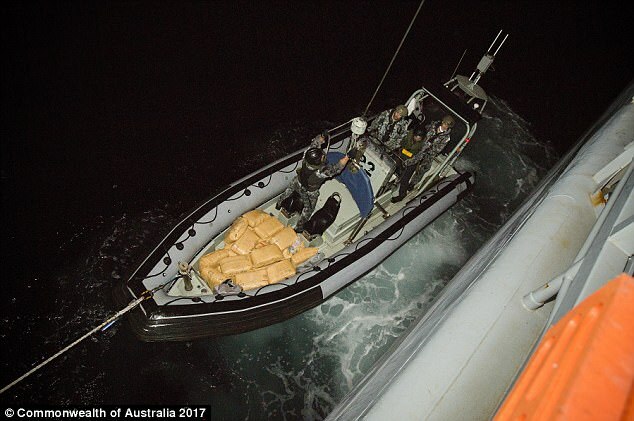 Warship HMAS Warramunga seized almost eight tonnes of hashish and 69 kilograms of heroin from three ships between December 27 and 29. 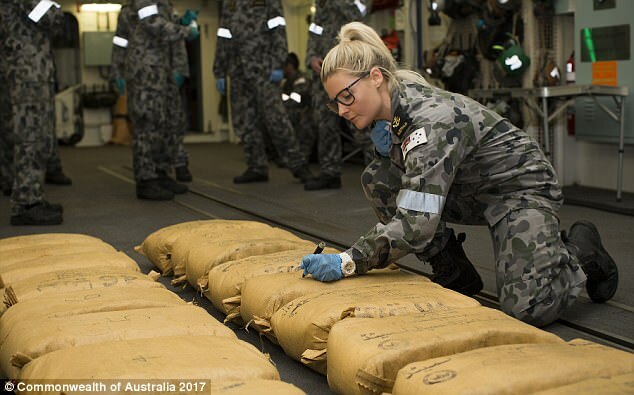 The record haul of drugs, worth around $415 million overall, would have been sent across the globe by the alleged smugglers, the Department of Defence claimed. 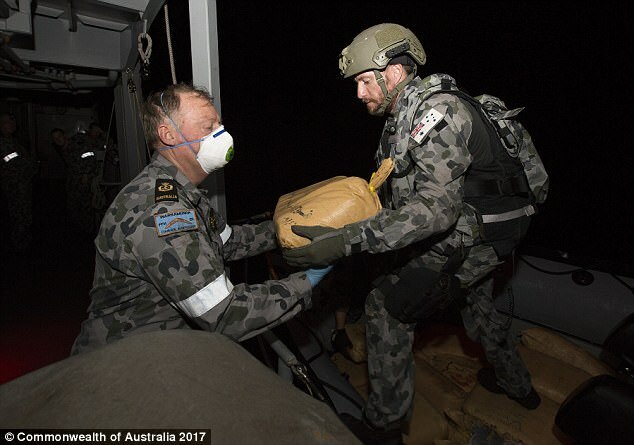 ‘The operation will impact on the flow of narcotics around the world and the use of drug money to fund extremist organisations,’ the Commander of Australian Forces in the Middle East, Major General John Frewen, said in a statement on Saturday. 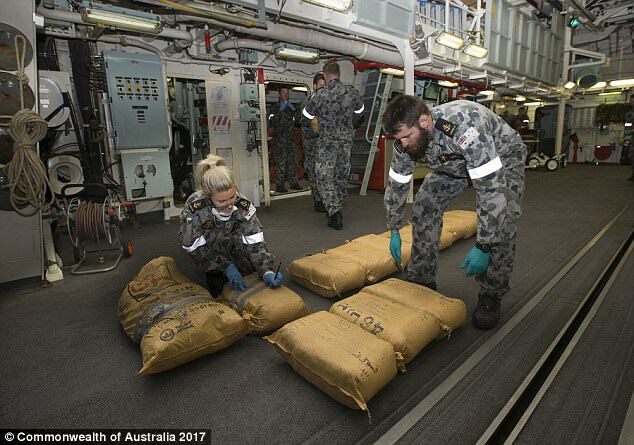 ‘These drug seizures support Australia’s long-term mission to ensure maritime security and stability in the region,’ he added. The operation was months in the making, co-ordinated by the Combined Maritime Forces and supported by Australian and Canadian staff. 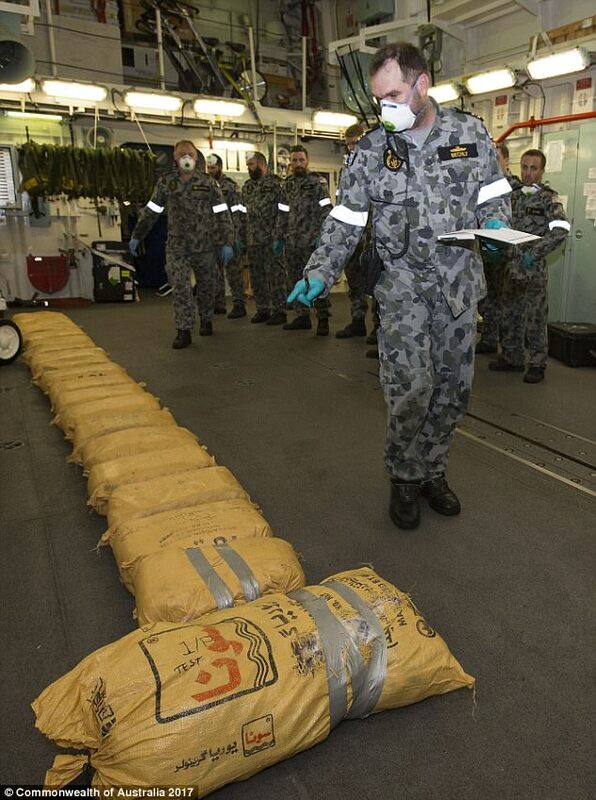 It’s largest haul of hashish seized by an Australian ship in Middle East maritime security operations. Commanding Officer HMAS Warramunga, Commander Dugald Clelland RAN, said the operation was the result of months of hard work by the ship’s company. ‘The crew prepared extensively for a task like this and we were able to employ our helicopter and boarding crews to locate and board three suspect vessels. 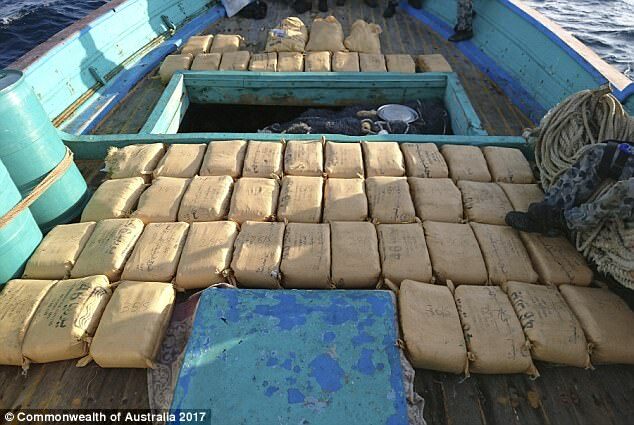 ‘A thorough search by the boarding parties uncovered a large quantity of hashish and heroin intended for distribution around the world,’ Commander Clelland said. The illegal drugs will be disposed at sea at a later date. Amid a week when each new day seems to bring a new homicide in Huntington, Friday will bring a new boost in resources among city, state and federal law enforcement officers. Gov. Jim Justice on Thursday ordered the West Virginia National Guard to provide more resources to its counter-narcotics program in Huntington to support a more broad patrol of the city and free up more resources among law enforcement agencies in Huntington. Justice ordered the Guard actions hours after the Huntington Police Department launched its 19th homicide investigation of 2017. Maj. Gen. James Hoyer, West Virginia’s adjutant general and head of the state’s National Guard, wouldn’t go as far as to say the support is a “boots on the ground” effort or a deployment of Guardsmen. Instead, it’s a bump in manpower for the Guard’s counter-narcotics support program, which has been present in the city and helping police there for 20 years, Hoyer said. “The focus of what the governor wants the Guard to do is what we have done for a number of years, and we are pretty good at — providing that technical support so the law enforcement officers can get out and spend their time doing the law enforcement work that they need to do in greater numbers,” Hoyer said. The nature of the governor’s order will provide additional National Guard members in Huntington beginning Friday, and their work will include analytical support and some aviation assets, to allow Huntington police officers to patrol West Virginia’s second-largest city from the sky, Hoyer said. Huntington Mayor Steve Williams was hesitant to provide any additional details regarding other types of tactics law enforcement and city, state and federal officials will take in response to the spike in criminal activity. Williams applauded the teamwork among Huntington police, Marshall University police, the Cabell County Sheriff’s Office, the West Virginia State Police and federal law enforcement officers. The homicide rate in Huntington for 2017 is the highest it’s been in three decades. This week alone, there have been five shootings in which six people were shot. Three people died as a result of the wounds they suffered in the shootings. Prior to Justice’s announcement Thursday, Huntington police Capt. Hank Dial said there was a strong probability that at least two of this week’s shootings are related. As of Wednesday, police had made arrests in 13 of the homicide cases reported this year. On Thursday, Dial said arrest warrants had been issued for two people involved in a fatal shooting last month. The sharp increase in homicides in Huntington has been attributed to illegal drug activity and staffing issues with the Huntington Police Department. MOSCOW (Reuters) – Russian President Vladimir Putin told his Syrian counterpart Bashar al-Assad in a new year’s greeting that Russia will continue supporting Syria’s efforts to defend its sovereignty, the Kremlin said on Saturday. Putin stressed that Russia would “continue to render every assistance to Syria in the protection of state sovereignty, unity and territorial integrity, in the promotion of a political settlement process, as well as in efforts to restore the national economy,” the Kremlin said. Earlier this month Putin ordered the Russian forces in Syria to start withdrawing from the country, but said Russia would keep its Hmeymim air base in Syria’s Latakia Province as well as its naval facility at Tartous “on a permanent basis”. Russia first launched air strikes in Syria in September 2015 in its biggest Middle East intervention in decades, turning the tide of the conflict in Assad’s favor. BEIRUT, LEBANON (6:25 P.M.) – Two jihadist militias operating in rebel-held east Damascus, Ha’yat Tahrir al-Sham (formerly Jabhat al-Nusra, the Syrian branch of Al-Qaeda) and Ahrar al-Sham (Muslim Brotherhood affiliate), have joined forces and launched a powerful offensive against the Syrian Arab Army, targeting a vulnerable salient in the district of Harasta. According to reports, Ha’yat Tahrir al-Sham and Ahrar al-Sham opened up their offensive with bulldozer bomb driven by a Saudi jihadist. It is unclear if the suicide bomber his mark intended mark or if his charge was destroyed per-maturely by army forces. Immediately after the bulldozer detonated, violent clashes erupted in the area surrounding a key army base, represented by a vehicle depot, currently held by pro-government forces. It appears the military installation is the main target of the jihadist offensive. At first, rebel fighters managed to overrun some army positions near the vehicle depot, however, the Syrian Army responded by calling on artillery and airstrikes which in turn laid down a wall of suppressible fire with shells, rockets and bombs. Syrian army forces also detonated a prepared tunnel bomb which helped in foiling an assault by militants from the northern approaches to the base. Clashes are ongoing for the area despite some reports suggesting otherwise, however it appears for now the Syrian Army has managed to stabilize the situation and may soon launch a counter-attack to reclaim lost positions. Some MPs have accused government of fueling the crisis in the country after ousting Atta Mohammad Noor. 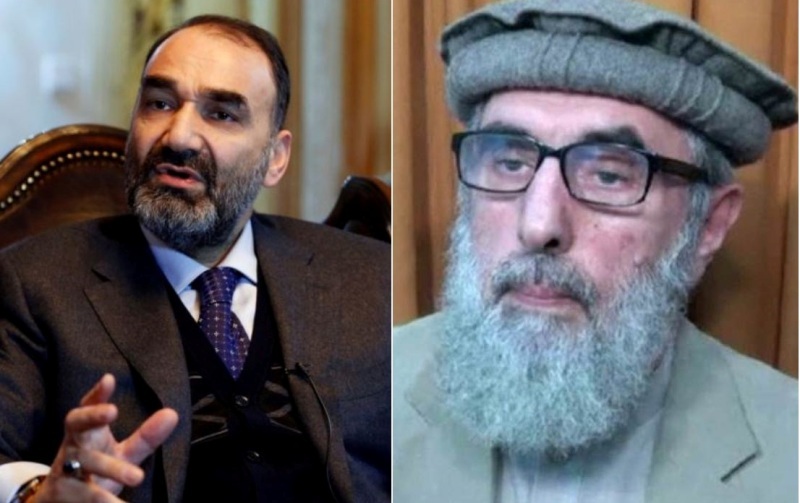 Some members of Afghanistan’s Wolesi Jirga, the Lower House of Parliament, on Wednesday said that a number of Jihadi commanders and citizens have been armed in support of Atta Mohammad Noor, the governor of Balkh, who was recently ousted by President Ashraf Ghani. The legislators accused the government of fueling a crisis in the country. The MPs reiterated the call to government officials to engage in talks with Jamiat-e-Islami party where Noor serves as chief executive and resolve their disputes through diplomacy and negotiations. “All people have been armed, all people have taken up guns including men and women and are prepared to do what the honorable governor of Balkh tells them,” said MP Breshna Rafi. “You all must be aware that we will create a major coalition inside and outside parliament and no one will dare to stand before it,” said MP Zahir Qadeer. “Removal of Ustad Atta from Balkh province has several aspects, the honorable governor was tackled with political and ethnic discrimination and they want to weaken a particular ethnicity,” said MP Abdul Hai Akhundzada. “We call on both Jamiat and the government not to prolong this issue more than this,” said MP Farishta Amini. “The government must bring an end to the issue according to the demands of Jamiat,” said MP Qazi Abdul Rahim. In addition, the administrative board of parliament pledged to mediate between the two sides, but stated that government is obliged to take all possible steps that could lead to ease tensions in the face of ongoing issues facing the nation. 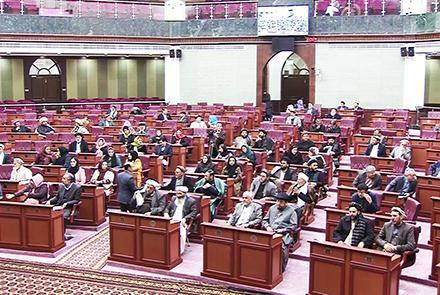 “If needed, we will send a delegation comprising people from all ethnicities to address the issue and resolve it,” said Nazir Ahmadzai, second deputy of parliament. The lawmakers warned that tensions between the two sides will have serious implications for the country. The myth of the Afghan safe haven just won’t die. In 2001, after the 9/11 attacks, the United States invaded Afghanistan and quickly smashed the Taliban government. It also killed hundreds of members of the al Qaeda group that had launched the attacks, although leaders Osama bin Laden and Ayman al Zawahiri escaped to Pakistan, along with about 200 followers. Ever since, we have been told that the U.S. military occupation of Afghanistan must continue indefinitely or else al Qaeda will return and make the country once again into a “safe haven” from which to attack the United States. In U.S. political discourse and news stories, this has often been stated as a flat fact, beyond dispute. Last August, Donald Trump invoked the threat of Afghanistan as a terrorist sanctuary torationalize extending the already 16-year war indefinitely and increasing the U.S. military presence by at least 4,000 troops. The president cited the same argument heard since 9/11: “A hasty withdrawal would create a vacuum that terrorists—including ISIS and al Qaeda—would instantly fill.” In his speech outlining the policy, Trump added that his government would not negotiate with the insurgency until some undefined point years from now. “Nobody knows if or when that will ever happen,” he said. The implication was that U.S. forces must stay and fight indefinitely or the country will once again become a base from which terrorists can attack America and its allies. This safe haven argument is a myth—a false but widely believed tale used to justify continuing a policy of perpetual failure. President Barack Obama often invoked this safe haven myth to justify his Afghan surge of 2009-2012, which moved some 60,000 extra troops into the country and brought the U.S. military contingent to nearly 100,000. He invoked it also to justify his decision to keep nearly 10,000 there through his presidency, thus reversing his promise to end the war. The conventional wisdom insists that Obama’s decision to temporarily pull troops out of Iraq led to the rise of the Islamic State (ISIS) and its short-lived “caliphate” in western Iraq and eastern Syria. But in fact a much greater factor was the Bush administration’s invasion of Iraq in the first place and Obama’s later support for the violent uprisings in Libya and Syria. In Yemen, the war against al Qaeda and the eventual regime change and war against al Qaeda’s enemies, the Houthis, have likewise increased the bin Ladenites’ power and influence there. But leaders of both U.S. political parties and major media outlets have supported these policies, and to justify that position they ignore the role of Iraq and Obama’s post-Iraq interventions in exacerbating the situation. Instead, they say, the ceasing of intervention in any area causes matters to become worse. But because of the Bush and Obama interventions since the 2001 Afghan invasion, the al Qaeda and ISIS safe havens are now all far from Afghanistan, in the U.S.-created “failed states” of Iraq, Syria, Yemen, and Libya. Furthermore, terrorists don’t need safe havens from which to strike. As we’ve seen in recent attacks in the United States and Europe, one or two men with rifles or a truck can do plenty of damage with no more preparation space than a rented apartment. Trump invoked the recent attack in Barcelona in his Afghanistan escalation speech. But none of those attackers had any direct tie to Afghanistan or any of the other major al Qaeda battle zones of the past few years. The few dozen core al Qaeda members who survived the initial Air Force bombing campaign in Afghanistan fled the country by the end of 2001. They were a non-factor in the war against the Taliban regime, and at no point did they have major influence in the insurgency against the occupation that grew up in later years. If any did come back they would be irrelevant. Afghanistan is exile, as far as anyone can get from anywhere. It provides no special access to any Western target. The September 11 hijackers, none of whom were Afghans, gained entry to the United States under regular tourist and student visas. The terrorists launched the attacks from Massachusetts, Virginia, and New Jersey. They had planned them in Malaysia, Germany, Spain, California, Florida, and Maryland. True, Afghanistan benefited our enemies in its distance from the United States, making it somewhat difficult for America to hit back against targets there. But by 2002 there were no targets left in Afghanistan to bomb. Al Qaeda’s surviving members had fled to the neighboring state of Pakistan, an American ally. Most of them spread from Pakistan to other parts of the region, planning further attacks in Yemen, Saudi Arabia, Qatar, Iraq, and Syria. According to former FBI counterterrorism expert Ali Soufan, those left hiding in Pakistan tried to set an example for others in the region, changing from “Chief Operators” to “Chief Motivators” for others seeking to join the war against America. And yet the Bush and Obama administrations went to extensive lengths in pushing the ridiculous safe haven myth. They argued essentially that America could never leave Afghanistan because then the Afghan state would fail, the Taliban would regain power, and al Qaeda would be invited back into the country. Indeed, in the early years of the war it was common to hear the terms “al Qaeda” and “Taliban” used interchangeably as the government worked hard to conflate Osama bin Laden’s group with Mullah Omar’s government. But as Alex Strick van Linschoten and Felix Kuehn demonstrate in their book, An Enemy We Created: The Myth of the Taliban-Al Qaeda Merger in Afghanistan, the former Taliban leader couldn’t stand bin Laden and resented the radical terrorist’s threat to his fledgling regime, putting it in the crosshairs of the American superpower. 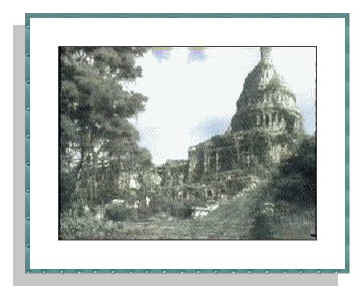 When the Washington Times’s Arnaud de Borchgrave interviewed Omar in summer 2001 he complained that bin Laden was like a “chicken bone stuck in his throat, that he can’t swallow or spit out.” An Army War College study said that bin Laden had refused to swear loyalty to Omar other than through a deniable proxy. When the war came, the Taliban progressively loosened its conditions for extradition. First, it offered to surrender bin Laden and his men to an impartial Muslim state upon receiving evidence of bin Laden’s role in the attacks; next, it offered to turn bin Laden over to Pakistan upon being presented with evidence; and finally, once U.S. bombs started falling, the Taliban agreed to hand bin Laden over to any third country, even without evidence of his guilt. By then it was too late for the Taliban—but not for the lesson of the differences in the motives of these groups and the nature of their formerly uncomfortable, now non-existent alliance. It bears repeating that fewer than 200 al Qaeda members escaped to Pakistan at the start of the war and thus could return to Afghanistan. Many of those have been arrested by police and spies, gone back home to pick up the revolution there, or were killed in the CIA’s Obama-era Pakistan drone war. Iran also apprehended a significant number of Arabs who had crossed their border during the initial invasion; most of those eventually were deported back to their home countries. To justify continuing the Afghan mission, the U.S. government invoked the safe haven myth to obscure the fact that, though a handful of al Qaeda’s leaders had escaped, America had won the war. 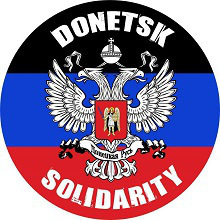 This small group of terrorists who had never managed to control their own county or district, much less any province or nation-state, were already dead, imprisoned, or had been driven out of the country, into further exile. Instead of declaring victory and coming home, the United States expanded its occupation strategy—and its list of enemies. The former Taliban government, initially acquiescent in defeat, has been fighting America and its NATO allies for almost 15 years, adding allies in the Haqqani Network and other groups. These forces have fought America and its allies to a stalemate. If there’s a safe haven in the situation, it’s Pakistan. But, aside from the mysterious longevity of al Qaeda leader Ayman al Zawahiri on Pakistani soil, the sanctuary provided by that country is for the Afghan Taliban and Haqqani network—in other words, local Pashtun tribal fighters, not international al Qaeda terrorists. During the debate over Afghan strategy at the beginning of the Obama administration, when the president wanted to focus on killing the last of the leaders of the old “core” al Qaeda in Pakistan with CIA drones, the military insisted on escalation. One story leaked to the McClatchy news organization emphasized the safe haven myth and accused the White House of “minimizing warnings” that if the Afghan Taliban retook parts of Afghanistan it would invite al Qaeda back in. In fact, there was no new intelligence estimate on that point. This was simply spin and conjecture by those who wanted to expand the war. Osama bin Laden was still alive and at large then, making the alleged threat of the return of old core al Qaeda to Afghanistan seem more urgent, though the danger was not any more real than it had been since 2002. After Trump became president, he seemed reluctant to escalate the war. He repeatedly delayed his decision on the new Afghan strategy and forced his National Security Council repeatedly to refine it. The president reportedly displayed his skepticism by invoking the failure of the Macedonians under Alexander the Great, as well as the Soviet Union more recently, to pacify the local Afghan population. This indicates an ability on the president’s part to differentiate between local tribal insurgents, fighting because our troops are on their front lawns, and international Arab terrorists intending to hit civilian targets inside the United States. In Afghanistan, the United States is fighting only the former. But war proponents can always invoke the safe haven myth: we still must never fully cut and run, or who knows what might happen? What if al Qaeda attacks us again? In reality, there is no reason to think al Qaeda would come back to Afghanistan were the Taliban to return to power, especially considering the trouble they generated the last time around. When van Linschoten and Kuehn contacted representatives of the Taliban’s Quetta Shura after bin Laden was killed in May 2011, the Taliban figures didn’t seem to care in the slightest that he was dead or how he had died. “We are fighting for Mullah Muhammad Omar. He is our emir. We have never fought for Osama bin Laden. His death does not matter to us. We will continue with our struggle.” In fact, al Qaeda did not have a single representative on the Taliban leadership’s Quetta Shura council. Even before Obama launched his surge, a number of administration officials conceded there was no reason to believe that a Taliban victory would mean a return of al Qaeda to Afghanistan. These included Vice President Biden; Richard Holbrooke, U.S. special representative to the region; and John Brennan, then head of counterterrorism, later CIA director. As the late war reporter Michael Hastings revealed, when Generals David Petraeus and Stanley McChrystal and their allies were pushing for the “surge” escalation in 2009, McChrystal neglected to even mention al Qaeda in his initial report. It wasn’t until Republican Senator Lindsey Graham reminded him of the importance of the safe haven argument that he began to frame the war in that way. It then became a major talking point until Obama finally relented and agreed to the surge. Six months into it, CIA Director Leon Panetta conceded to ABC News that al Qaeda represented no serious threat in Afghanistan. “I think at most, we’re looking at 50 to 100, maybe less,” he said, adding that al Qaeda’s main location was in the tribal areas of Pakistan. 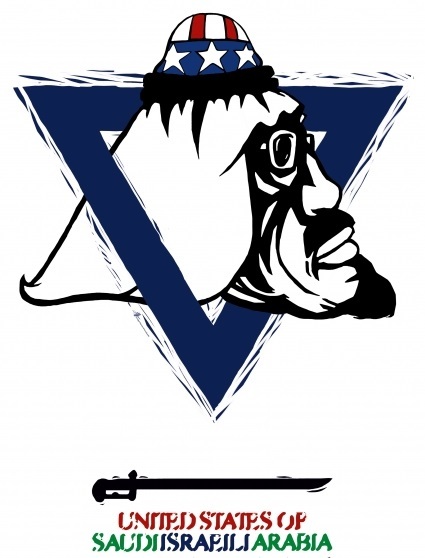 In fact, Panetta could not prove that there had been any Saudi or Egyptian mujahideen fighters left in the country for years, much less any real associates of bin Laden. But his concession should have been enough to cause a scandal: If “maybe less than 50” illusory al Qaeda fighters can keep us in the country indefinitely, is there any possible future context in which the government could declare victory over al Qaeda there, much less the Taliban? And if their presence was the reason for the war, why was eliminating them not the focus of the Obama escalation instead of the broader, obviously impossible, anti-Taliban, Pashtun-pacification counterinsurgency effort? In December 2009, following Obama’s surge announcement, journalist Patrick Cockburn explained that the Afghan occupation, far from preventing terrorist attacks by denying our antagonists safe-haven, actually increased the likelihood of attacks in Western countries. Just a month before, a U.S. Army major named Nidal Hasan, set to deploy to Afghanistan and upset about reports of U.S. war crimes against civilians there and the prospect of having to kill fellow Muslims, killed 13 soldiers and wounded more than 30 in a massacre at Fort Hood, Texas. It was later revealed that Hasan had been in contact with prominent American al Qaeda preacher Anwar al-Awlaki. Obama officials, insisting they had won the terror war and denying that blowback from U.S. policies had spurred this “lone wolf” attack, tried to spin the tragedy as “workplace violence,” as though Hassan had simply “gone postal.” But this was not truly “blowback,” defined as long-term consequences of secret foreign policies returning to haunt the United States, surprising the population and leaving them vulnerable to misinformation about the conflict. A more accurate way to identify this phenomenon would be to call it “backdraft,” when the direct consequences of the government’s openly declared foreign policies blow up right in all of our faces, undeniable to anyone but the most committed war hawks. This is borrowed from the term used by firefighters for when their ax-wielding or door-kicking intervention inadvertently provides oxygen to a heated and fuel-filled room, causing a massive explosion. In recent years, American domestic terrorists Najibullah Zazi (New York subway plot), Faisal Shahzad (attempted Times Square bomber), Dzhokhar Tsarnaev (Boston Marathon bombing), Omar Mateen (Orlando nightclub slaughter), Ahmad Khan Rahami (New York, New Jersey sidewalk bomber), and Amor M. Ftouhi (Flint, Michigan stabbing) have all cited America’s Afghan war as at least partial motivation for their attacks and attempted attacks on U.S. targets. Osama bin Laden is dead, and the war has been generating backdraft terrorist attacks against the United States. But haven’t you heard? ISIS is now in Afghanistan! Keep in mind, though, that ISIS is just a brand name. In Afghanistan, most of those who embrace the label are actually members of the Pakistani Taliban who fled Obama’s drone war and the Pakistani military’s infantry assaults back in 2010. They have now been joined by a relatively small number of former members of the Afghan Taliban as well—again, local Pashtun tribal fighters resisting rule from Kabul. For now, at least, these ISIS fighters are far outgunned by their Taliban competition, though U.S. Army and Air Force efforts in Nangarhar Province against those claiming ISIS’s name have only made them more powerful over the past few years. As Dutch reporter Bette Dam lamented, we are seeing the rest of the exact same dynamic play out with them as with the entire insurgency over the years: seeing this new threat, the Army and Air Force have launched a massive response. Since January 2015, the U.S. has bombed the eastern Nangarhar Province in an attempt to fight this small insurgent faction now claiming ISIS’s name. As a result, “they are creating unrest, hopelessness and new enemies.” The anti-occupation violence Dam predicted has continued to escalate. After a Green Beret was killed fighting ISIS in Nangarhar Province in April 2017, the U.S. Special Operations Command took revenge by dropping a 21,000-pound MOAB, “Massive Ordnance Air Blast,” on an enemy position. Since U.S. B-52s regularly bomb ISIS and Taliban targets—U.S. forces dropped more bombs in April 2017 than any other single month since 2012—the use of the MOAB in this instance seemed to be more about sending a message than anything else, though the military insisted the use of a fuel-air bomb was necessary to reach fighters hiding in tunnels deep underground. The U.S. military then maintained that there were still hundreds of ISIS fighters left in eastern Afghanistan, giving the safe haven myth a new life. Never mind mythical al Qaeda leaders one day returning from Pakistan; now local Afghan and Pakistani Pashtun tribal fighters resisting the occupation and Kabul-based government, while declaring themselves part of ISIS, provide another enemy to fight into the indefinite future. Having been eclipsed by the Taliban, the Islamic State seems to be focused on marketing itself to potential and active jihadists. For that, it needs publicity. President Trump’s big bomb provided exactly that. The destruction of a network of caves is the perfect advertisement to lure radicals undecided about joining a jihadist group and attract members from other groups. After the bombing and the subsequent military operations, the Islamic State in Khorasan’s radio station in Nangarhar has been roaring. One preacher called the bomb a blessing from God….This is a message skillfully tailored for young radicals, since for them American hostility is a stamp of a group’s credibility. The more a group is targeted by the United States, the greater its jihadi legitimacy. Trump says he will achieve victory in Afghanistan, but he embraces the same failed and counterproductive policies that have served to increase the size and strength of the Taliban-based insurgency, Haqqani Network and now ISIS. And, while the government still invokes the hollow safe haven myth and insists it is defending Americans from Afghanistan-based terrorism, its ongoing war in that troubled land, with no end in sight, only puts Americans in greater danger. Scott Horton hosts Antiwar Radio for KPFK 90.7 FM in Los Angeles and the Scott Horton Show from ScottHorton.org, is managing director of The Libertarian Institute, and opinion editor of Antiwar.com. This essay is adapted from his new book Fool’s Errand: Time to End the War in Afghanistan. Russian President Vladimir Putin vowed a crackdown after a supermarket bomb injured 10 people in St. Petersburg, the latest in a series of attacks linked to Islamic extremists that have targeted his home city. Putin said Thursday that he’d ordered the head of the Federal Security Service, in case of a threat to officers’ lives, “to act decisively, not to take any prisoners, to liquidate bandits on the spot,” in remarks at a televised ceremony with veterans of Russia’s military campaign in Syria. The device that blew up late Wednesday in Russia’s second-largest city contained an explosive force equivalent to 200 grams of TNT, the National Anti-Terrorist Committee said in a website statement. 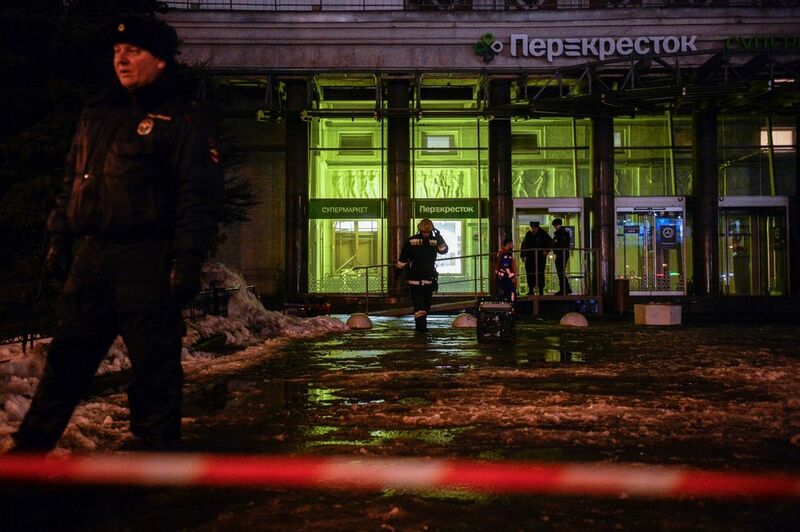 A man of non-Slavic appearance, who was recorded on security cameras, left the bomb in a backpack inside a locker in a Perekrestok supermarket before fleeing the scene, the Fontanka news service reported. The attack came after Putin thanked U.S. President Donald Trump last week for information passed on by the Central Intelligence Agency that he said helped break up an Islamic State cell plotting to bomb St. Petersburg’s Kazan Cathedral and other locations in the city. The tip-off saved “many lives,” Putin’s spokesman, Dmitry Peskov, said. In April, 14 people died in the St. Petersburg subway after a suicide bombing by a radical Islamist who was born in the central Asian republic of Kyrgyzstan. It marked the first major attack targeting Russia since October 2015, when Islamic State claimed responsibility for a bomb that downed a plane carrying Russian tourists from Egypt to St. Petersburg, killing all 224 on board. The plane attack came a month after Putin ordered Russia’s military to begin operations in support of Syrian President Bashar al-Assad against rebel groups in that country’s civil war. Russian officials have warned that several thousand militants from Russia fighting in Syria could return to stage attacks following the defeat there of Islamic State. When Putin ordered the Russian offensive in Syria, he said the goal was to destroy extremists and stop that from happening.